Wow! What a time I had with this piece. It is always good to challenge ones self, and this piece truly filled the bill. As an untrained artist it is sometimes so frustrating for me to try and figure out things on my own, when I have had no schooling on the subject. I know a good painting when I see it, yet I can’t tell you why it is good or why it is not. It is just something I see. I am a portrait artist and have recently started painting with acrylics. They are a little trying at times, as I love to blend and get realistic looking skin and acrylics dry fast and don’t blend well. I have also shied away from multiple subjects in a painting. Simply because it is tough enough getting one face to look like the person you are trying to capture, let alone several. But this picture captured my eye. A friend placed it on facebook and I immediately knew I had to try to capture the feeling it gave me. 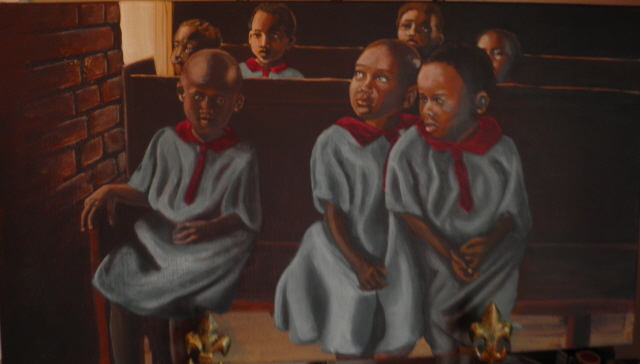 My eyes were drawn to the little girl in the center looking up, so hopeful. 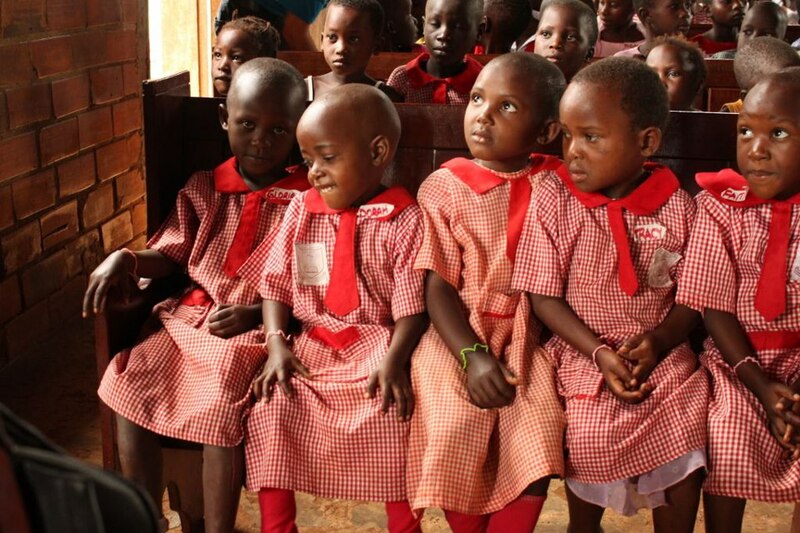 Now this is a picture of some Ugandan Orphan children who were waiting to receive a gift from Project Christmas Child. For some if not all of them it was their first gift in a life time. 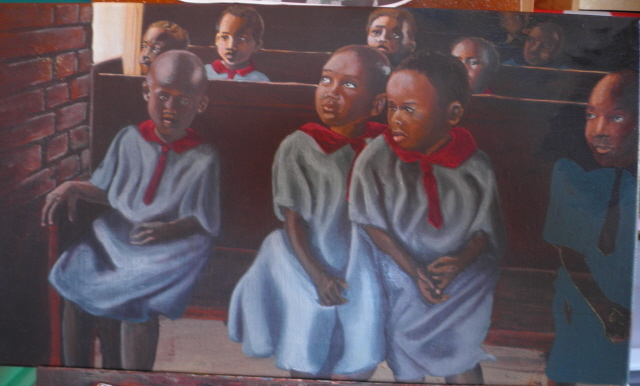 I stretched a special canvas just for this project, just to give it the dimensions that I wanted. I applied the layers of Gesso and let them dry. 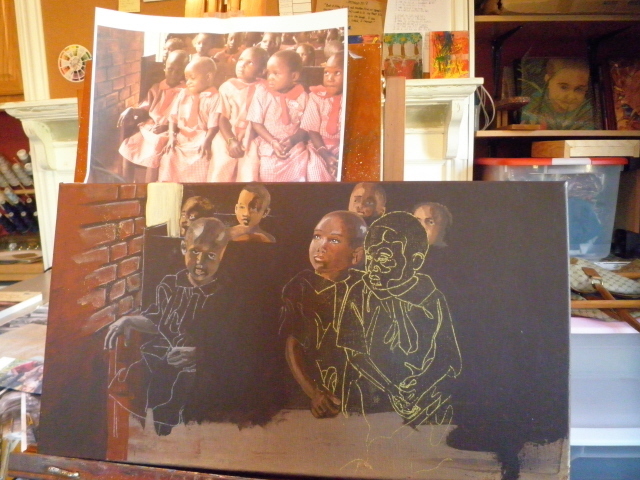 Then I painted the entire canvas with a soft black to best incorporate my shadows. Then I set forth to draw and copy that picture onto my canvas. 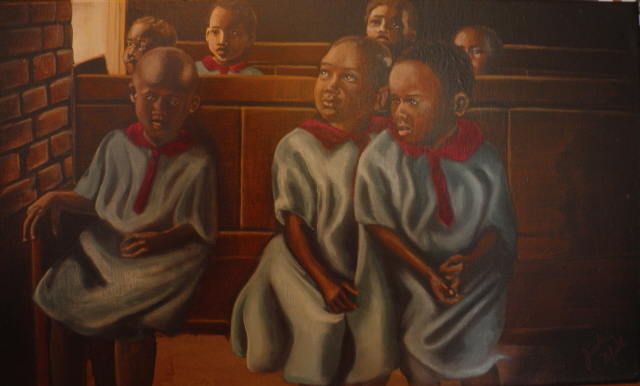 At first I drew all the children on my canvas but decided that it was to busy and distracted from the true focal point that I wanted to emphasize. So I washed a few out and painted over one after I had completed the rough in of the face and arms. After deciding that I had the right amount of subjects in the painting a began to block in the clothing and benches and start a little suggestion of detail. 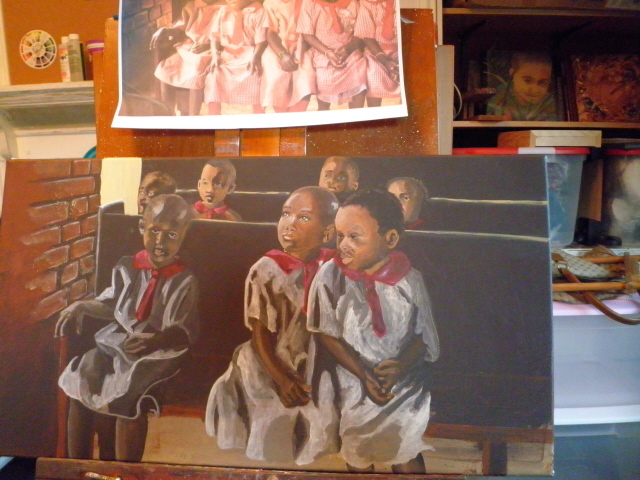 I blocked in the dresses with white as my first thought was to just replicate the photo, but as I began to add the red I noticed that my focus shifted from the faces to the dresses. Something I did not want to happen. I tried pink, coral, and Yellow for the dresses but still had the same result. I had had it in the back of my mind the whole time to make the dresses Teal blue, but again was unsure of myself and talked myself out of it. Once everything else failed I tried the teal, and I loved it. again my focus was back on the beautiful face in the middle. But still something was off. It wasn’t turning out just like I had envisioned and I was frustrated. I stopped for several days and just sat and stared at it, not knowing what to do. Finally I turned to YouTube and tried again to find something on composition, and low and behold I finally found someone who successfully described what composition is and how to make it work for you. Click here to watch. I realized that by using the RULE OF THIRDS that I had slightly misplaces my focal point, but that it was within the parameters. The artist was using a landscape as his sample painting and he mentioned that it was good to continue the painting to the edges, to keep the eye imagining the entire surroundings. So not knowing for sure if it worked that way with people, I decided to add a few more to give the eye more interest. This too added distraction to my eye and now i was looking at the person on the edge and nothing else. So again I painted out the extra Children I had added. Frustrated and back to where I was before I sat and stared at my painting, not knowing what to do next. Then In desperation I posted my dilemma on facebook and asked my friends to help me out. One friend suggested that the painting was very dark and maybe adding more light would help. Again this was something I was planning on doing, along with adding more detail, but I didn’t think it would help the composition along and I really wanted to get that right first, then add details. But in desperation I decided to head the advice. So I added some light and detail and see where that left me. As I started to work on lightening up the benches I realized that my lines were a mess. The benches clearly were out of perspective and drawing the eye out of the painting. As I straightened up the lines and added detail to benches, I became more and more please and less and less frustrated. This was actually working great. I added the finishing touches to the faces arms and dresses, even added a few to the brick as well as more detail to the benches then was there originally. I then faded out my lines on the edge by adding a dark soft black glaze which helped to spotlight the center of the painting. Beautiful, Jackie. You are truly gifted.